The first phone I ever got was a tiny Motorola C118. My friends had camera phones and flip phones but I was so excited about mine too. Growing up in a household that had so many people, I had learnt to be content with my possessions at a young age. So as I progressed through the phones, from Motorola to Blackberry to Huawei, I used a phone to its highest capabilities until it broke down. Early this year, The Hub decided he had had enough of my talking about how much I loved the Samsung S series and got one for me. Now I could have easily got it for myself but I suffer from such a strong case of indecision that it would have taken a year to choose which one I wanted. Have you watched those shows about people that keep loads of equipment and trash in their houses? Well I’m like that, I keep everything. I never delete my texts. I take a huge number of pictures and videos every day. I take pictures of everything and I can’t delete any of them just in case I need them some time in the future. I have a long list of bookmarked internet pages. I collect pictures from the internet all the time. And it doesn’t help matters that I have such a wide range of interests from feminist quotes to pancake recipes and how to wear boyfriend jeans. It’s all there in my saved pages. I have I.T training, I know with every breath in me that backup is of utmost importance. But I hardly ever backup my stuff. I have all of this year’s pictures on my phone and camera and I haven’t bothered to move them to a more secure place. I have lost data before so I should learn from my experiences but I never do. As a blogger I have lots of technological needs and there is always an app for each particular one. So I find myself getting a new app every few days. The problem is that I don’t uninstall them when I don’t need them anymore and they end up clogging up my phone. The only extra memory I have is a 2GB Memory card. And anyone will tell you that 2GB won’t hold enough. But I never remember to get a bigger one when I’m at the stores. I evidently need to clear out my texts more regularly. Some of the things I keep never turn out to be useful. I need to stop holding on to things just because I think I might want them later. But the truth is I’ll probably never need them again. So I need to clear my cached pages, uninstall the apps I will not use again and delete some of those 10 pictures I took of the exact same thing (one copy is enough). Most people think moving data from your phone to your laptop is enough backup but it’s not. You need to have a designated device that is solely for backup. Or you could use cloud storage so you can access it from anywhere. I plan on buying an external hard disk for the singular purpose of storing my videos and pictures. I plan on getting a larger memory card. My 2GB card just isn’t doing anything for me. Some phones have a limit of how much additional storage they can handle so I’ll make sure to check what my phone can take. Are you a digital hoarder? Or do you have some other technological illnesses? 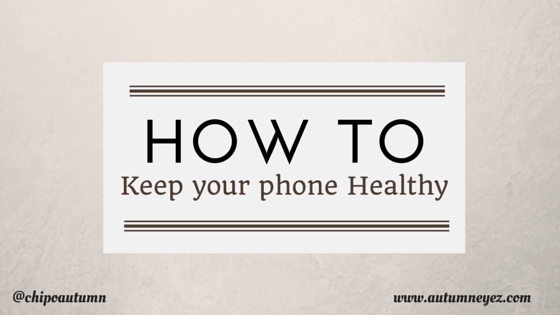 Do you have any more tips and tricks on how to keep a phone running smoothly? I’d like to hear what you think. P.S: You can also read about what I do to keep myself safe on the internet. It does feel like a job. I think procrastination is another a problem. I always tell myself that I’ll do it later but I never do. The struggle is so real, I tell you. I also want a bigger card. I’ll try to get one as soon as possible. 3000?!! That’s a lot! I have 500. But that’s just for this year. They are from my old phone plus this one.. then I have a bunch of shoes. So everything all together..